For many Moravian leaders—pastors, congregational leaders, agency heads and others—the impetus to make the Moravian Church central in their lives can be traced back to their time at a Moravian camp. 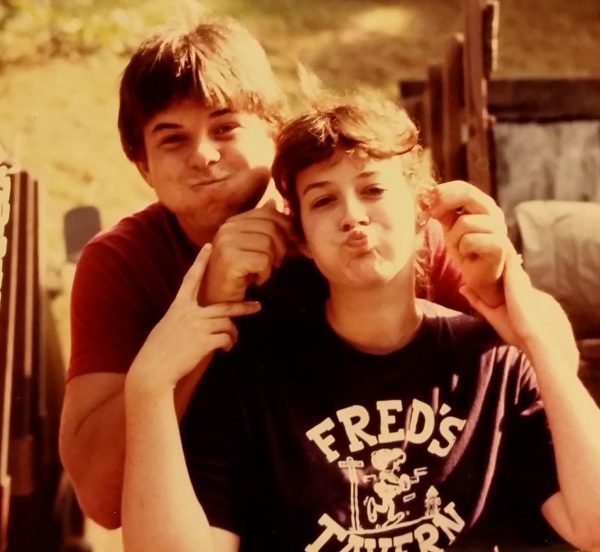 Whether as a camper, a counselor, or in many cases, both, experiencing God in the woods of Wisconsin, North Carolina, New Jersey or Ohio had a tremendous impact on their future with the church. As part of our annual issue devoted to Moravian Camping Ministries, we asked a number of today’s church leaders to share their thoughts about what “camp” means to them, and how it made a difference in their lives. What follows are just a few of the many stories Moravians tell about their camping experiences. We invite you to share your thoughts about the impact camp had—or continues to have—on your faith journey. We will share selected comments in future issues and in conjunction with this article’s online posting. 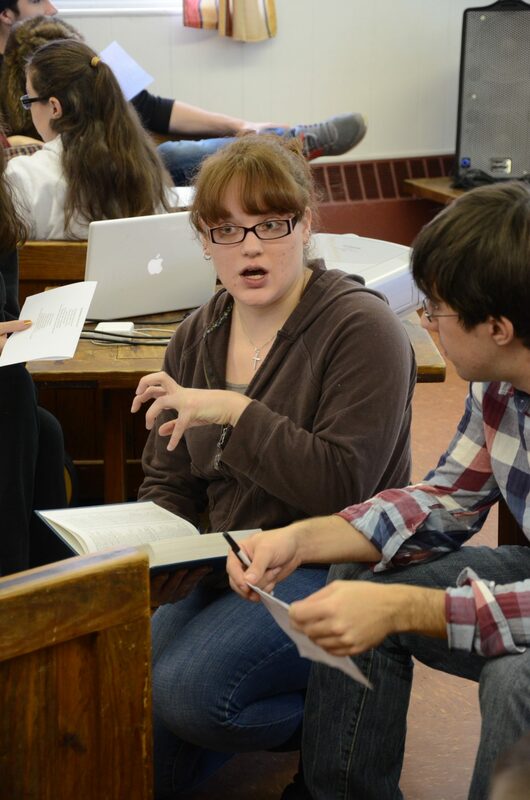 Send your Moravian camp insights to [email protected]. This is what my experience of camping ministry has been over the years: A community of God’s children almost seamlessly woven into the natural environment that is itself a reflection of God’s wonder and love. While I grew up experiencing this at Laurel Ridge as a camper beginning in the fourth grade, my life in the Moravian church has now enabled me to experience this miracle at Tar Hollow, Mt. Morris, Van-Es, and Hope. And while the traditions and stories are different in each place, the basic truth is the same. Camping ministry at its best is a compliment to the Christian education and community that happens within the life of local congregations all year long. Sunday school classes, worship services, confirmation, pot luck dinners and fellowship events are at the heart what make the local church a place where God’s grace and the love of Jesus are made real for people of all ages. But add to that the opportunity to pull away from our normal routines for a week of intensive community building, close proximity to nature, daily extended worship and small group interaction, and a place to play and laugh together, and something magic happens. This is what camping ministry is all about. I know that I am not alone in saying that had it not been for the camping ministry experiences of my childhood, adolescence, and young adult life, the chances of me being in the church at all, much less serving it as I do, would have been reduced significantly. Each year, camping ministry gave me a new community of peers to learn and play with, and adults to nurture me and serve as examples of Christ’s love. These adults also then taught me lessons about how wonderfully God has woven our world together, loved us enough to send us Jesus, and moved profoundly in our midst by the Holy Spirit. This environment is hard to duplicate for a couple of hours on a Sunday morning. The local church needs the camping ministry. I would challenge pastors and congregations to make camping ministry an important part of their overall ministry plan for each of the children entrusted to their care. I would challenge parents to make sure that summer plans include time to attend camp for each of their children. I would challenge all adults to seriously consider setting aside a week of their time each summer to serve as counselors or support staff for a camp as well. These weeks cannot happen without folks willing to serve. I thank God for blessing me with so many life-changing camping experiences. Still today it is where my soul is most filled with God’s wonder and love. It is easy for me to say that at the foundation of my faith lies 23 years of camping ministry. I have had the heartwarming experience to attend both as camper and as a staff member, and every camp I’ve attended has now become part of my beautiful journey closer to God. I’ve often said that at the top of the list of things that we Moravians are doing ‘right’ is our camping ministry. While it may not seem like much to those from the outside looking in, for those of us who have set foot on the sacred ground of a Moravian church camp, there is an understanding that you cannot explain to others; it can only be experienced. This time together as a very unique community of faith is truly transformational, spiritually uplifting, and educational. 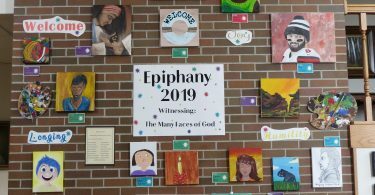 If you have not taken advantage of the opportunity to attend camp as a camper or staff member, you are missing out on one of the most beautiful faith-forming experiences the Moravian church offers. Thank you to the many men, women and children who have made and continue to make our camping programs wonderful year after year! – The Rev. Greg Behrend, pastor, Our Savior’s Moravian Church, Altura, Minn. When I was nine, my parents took my older sister to Hope Conference and Renewal Center for the first time. She was attending Troubadour Camp. At that age, I didn’t feel I was ready to go to camp and be away from home. I saw the joy on my sister’s face as she unloaded her bags in the cabin and made her bunk. There were kids everywhere and everyone looked so excited! That was my first experience with the place that has connected me to God and others so completely and transformed my life and faith. Though I asked my parents to let me stay, the fact that I didn’t have any supplies was a bit of an obstacle and we headed home. I was overcome with the desire to attend Camp Hope; the next summer I attended Swim Camp and loved it! Spending hours in the pool and with friends rekindled the joy I felt the year before. I remember camp fires with Sister Carol Dague introducing me to the song “All God’s Critters have a Place in the Choir” and leading us through studies as well as Sister Jody Lean (Harney), being the dean and counselor in our stinky cabin of 11 girls! I continued to be a part of camping ministries until I aged out of Senior/Post High. I served as a counselor for Pre-Primary Camp as a teen and eventually became part of a dean T\team for the camp with the support of Brother Mike Rampulla and Sister Cynthia Rader-Geyer. I was an exchange camper where I traveled to Laurel Ridge and met more Moravians and had more mountaintop experiences. Tobiassen were two. 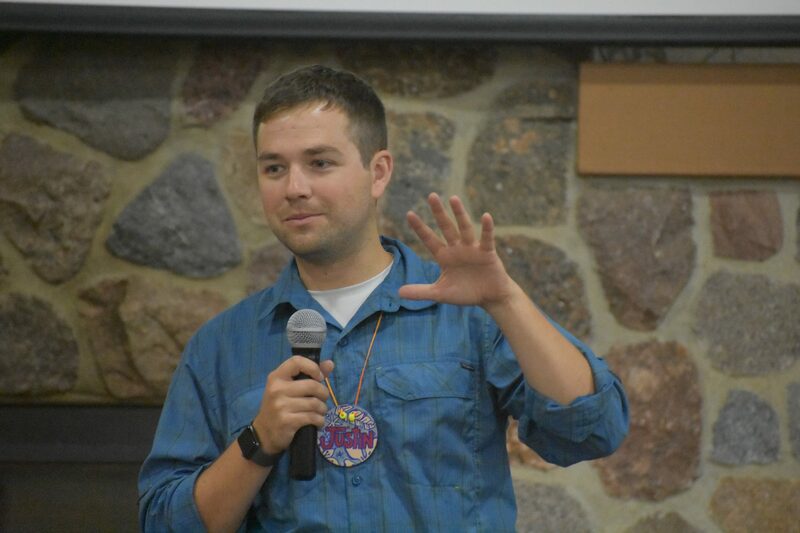 I continued my camping ministries leading Mid-Winter Retreat in seminary and now as a chaplain for Pre-Primary and the program leader for Senior High. When they say the relationships you make at camp stay with you, they mean it. Your own Cloud of Witnesses surround you every step and you get the opportunity to step into that every time you go back to Hope. –The Rev. Rebecca Sislely is pastor of First Moravian Church in Riverside, N.J. and will be at Camp Hope for two weeks this summer. “I don’t know… I guess we could say we will read the Bible more.” That was the covenant, pretty much verbatim, I made with a friend at Winmor (middle school camp in the Western District) in the summer of 2001. It was the first year Winmor was held at Mt. Morris Camp & Conference Center, and as campers we were being encouraged to make a covenant with another camper to hold each other accountable to take a lesson from camp home with us. Yet, when my friend and I returned to Winmor as counselors several years later, we reminisced on the impact those weeks together at camp had on us, and we decided to follow through on our commitment. More than a decade later we still annually choose a Bible reading plan that we work through together, and I know my faith has grown in a way it never would have without that intentional time spent studying the Bible; and it all goes back to camp. When I return to camp now as a counselor, RYC advisor, or program leader, I try to never take for granted the way in which each and every moment at camp, in a safe and fun-filled environment for spiritual growth, can be a chance to offer encouragement and invite someone to make their own covenant to continue to grow in and live out their faith. 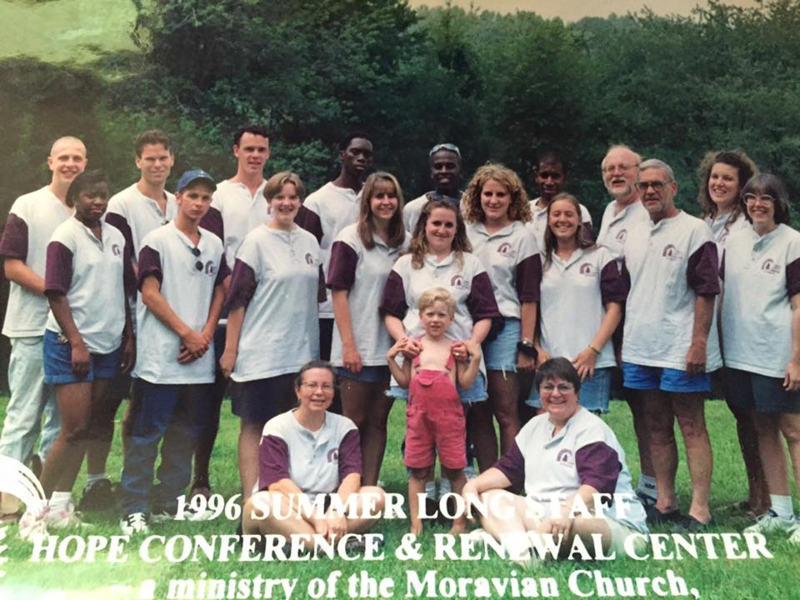 We may not see the result immediately, but when we look at the number of people involved in Moravian ministries, it is no coincidence that many of them have fantastic camp memories which helped guide them on their faith journey. Where else but camp can your ministry include sitting with a camper and praying about their discernment process as they seek out their vocation, and two hours later find yourself hiding for half an hour 25 feet up in a tree, wearing a moose hat, waiting for your cue to surprise everyone you were up there and lead a silly campfire song? My first contact with the Mid-States youth programs was in 1981 as a camper. I attended Spring Rally at a now closed church in Michigan where the Rev. 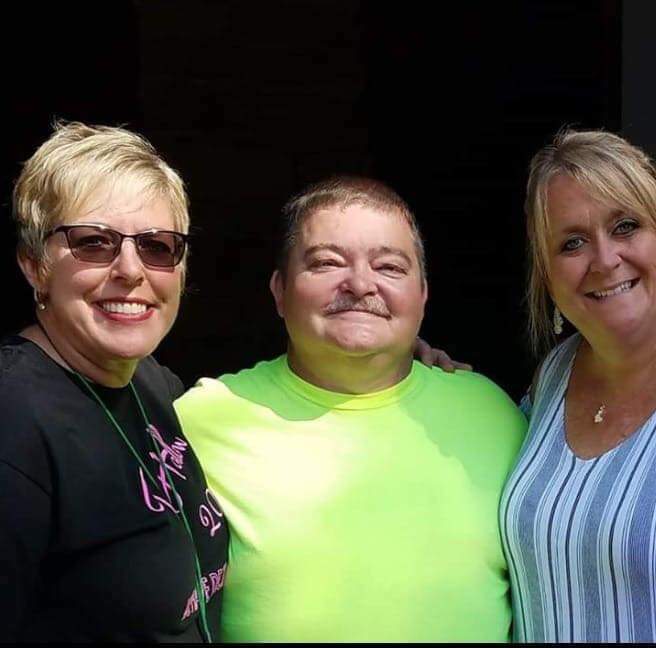 Darryl Bell was the pastor, then attended Tar Hollow in July. I was hooked. 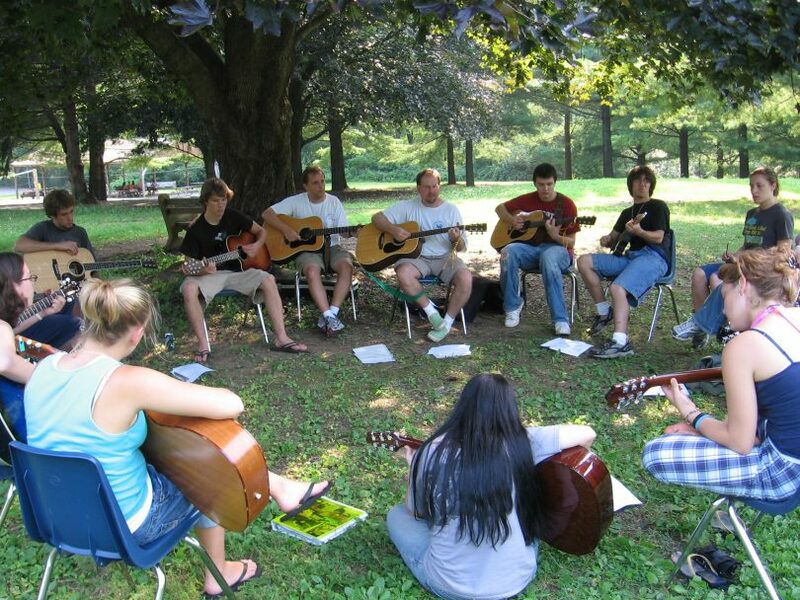 Back then, Tar Hollow was for campers in grades 7 – 12. My first experience was a great one! I had a small group leader who made a difference in this then-shy adolescent girl. Every year through 1986, I never missed a camp or rally. I even packed weeks ahead to get ready for Tar Hollow. Tar Hollow is a state park in Laurelville, Ohio. It does not have the most luxurious accommodations. There is no air conditioning in the lodge or cabins. The cabins are quite a hike up a hill from the lodge, and they have many cracks and crevices through which bugs, sprickets, bats and mice find their way. And in 1981, the shower houses were down the hill by the lodge. In spite of the rustic setting, I was there to stay. Many people from that first year at camp continue to touch my life over the years and remain lifelong friends. We are still “there” for each other through life’s many challenges even though we are hundreds of miles apart. I returned to Tar Hollow in 1990 and became a counselor. By this time, there were some changes to the camping program: the addition of a junior high camp and primary camps, and Tar Hollow was now for campers in 9th grade through age 21. I was nervous, but so excited to return to the place that meant so much to me through the development of my relationship with Christ. I wanted to share that excitement with others, spread the love of God and the love of Tar Hollow. Through the years, campers have come and gone, and some of the staff have changed. But many, like I, continue through the years. Some of the current staff were even staff when I was a camper; others were fellow campers with me in the 1980’s. We have seen many of our children come through as campers. And that first pastor at the first rally I attended, Darryl Bell? He is in his third year of directorship at Tar Hollow. Take a look around the church. Who is leading? From where I sit within the provincial organization, nearly everyone in a significant position within an agency or institution share one common life experience… they went to camp. For those of us in the Southern Province of the Moravian Church, that means Laurel Ridge. In fact, many of us actually worked on the M-Staff, where as summer staffers we played guitar, guarded swimmers, led activities, and cleaned lots of bathrooms. If not M-Staff, many leaders once served as counselors or visited Laurel Ridge as a camper. Others served on the Regional Youth Council (RYC), a youth organization made up of representatives from each congregation. 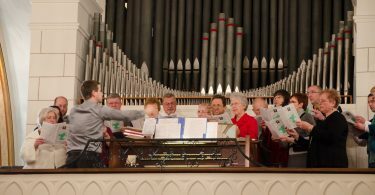 Why am I a leader in the Moravian Church? Circumstance, birth order, personality and nurture all played a role, but ultimately, I believe I am where I am today for two primary reasons: 1) my leadership capability emerged from my lived experience as a young Moravian, and 2) I had mentors who believed in me and encouraged me to use my giftedness so I might strive to become all that God created me to be. Tammy Rinker, second from right, and the 1996 staff at Camp Hope. In 1996, as a freshly minted college graduate, I packed up my things and went to serve Camp Hope as the resident Art Specialist. Camp rules being a little different in those years, I brought my young son, Robert, with me. We quickly fell into the rhythm of camp life, focused around mealtimes and evening campfires. Meals and campfires were camp-wide events; everyone in camp attended. Table fellowship and evening vespers at the fire informed and shaped our service. As the ‘Art Lady’ I had a tiny budget for supplies and a lot of campers coming. Consequently, I had to be resourceful. Glue and old magazines were in abundance, so I taught the campers to decoupage. The kids really loved it, so much so that that first year we decoupaged the rough equivalent of three city blocks. “Gimp” (plastic string for lanyards) was also a big deal at camp. We taught the campers how to weave lanyards—box, twist, and Jacob’s ladder were the most popular methods. While the campers weaved and decoupaged they talked. They told me stories about school, siblings, family, vacations, troubles, and challenges. I understood these were important – even holy moments. It was an honor to listen and, when trust was built, to pray together. 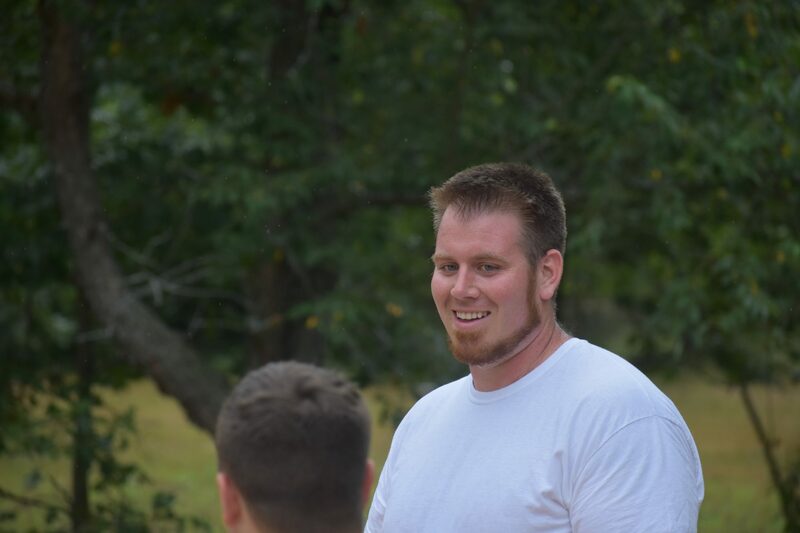 After my first year of seminary I decided to return to serve at camp again. This time camp needed a cook. Working in restaurants had funded my undergraduate education and I was pleased to put what I learned to even more good use serving the church. Each week brought in a whole new weekly staff of pastoral and lay leaders. Up until that point, I only knew my own pastor. I remember it being a surprise to meet all the different clergy. It was a pleasure to experience the different styles of serving and leading that each group of weekly staff brought with them. Those first two years I served side by side with Ostomy Matthew. He was the store clerk and office assistant. Our love of the church and friendship built on service blossomed into a relationship. In August of 1998 we decided to make our partnership permanent. We were married at my home church, Palmer Moravian, by our pastors, (then) Rev. Doug Kleintop and Bishop Stanley Thomas. Over the years we have served pastorates in New Jersey, Pennsylvania, Wisconsin, and now, Maryland. Through all of these various places of service, Camp Hope evolved into a second home base for us. All three of our children—Robert, Quinn, and Eve—attended camp as campers and later served on summer-long staff. Together we have been blessed to serve with Christians from many and diverse backgrounds. Os and I continue to serve and support Camp Hope, our home away from home. –The Rev. Tammie Rinker is pastor of Trinity Moravian Church in New Carollton, Md. She and Os will be the deans of Swim Camp, July 14-20.